This B&H Kit pairs the DJI Ronin 2 3-Axis Handheld/Aerial Stabilizer with the HPRC 2780W Wheeled Hard Case, which fits the gimbal, gimbal accessories, and a small mirrorless camera. The gimbal supports up to 30 lb and can be used handheld or mounted on a drone, Steadicam, car mount, or other support. The versatile Ronin 2 gimbal from DJI is suitable for use either handheld or mounted in a variety of ways including onto a drone, Steadicam, vehicle mount, and more. An update from the original Ronin, this motorized stabilization system is suitable for a range of camera and lens configurations, boasting a payload capacity of 30 pounds. This means it can be used for everything from DSLRs up to cinema cameras such as the ARRI ALEXA Mini or Sony FS7. Like its predecessor, the Ronin 2 features support for underslung, upright, and briefcase operation modes to help you achieve the best angle. However, it has been redesigned to enable easy transition between upright and underslung modes without changing the position of the camera. It also offers several other improvements, such as enhancements to the control software and physical design to simplify taking complex shots without sacrificing performance, all while making important functions more readily accessible. Use this 2780W Wheeled Hard Case from HPRC to transport and protect your DJI Ronin 2 gimbal system. The black hard-shell case features sturdy carry handles on the sides, and you can also use the retractable pull handle with two wheels for easy transport. Its seven-latch closure system keeps the case secure, and it is rated IP67 waterproof and dustproof. 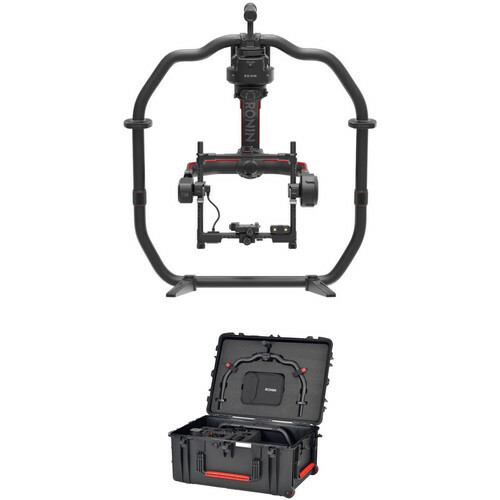 The two-level, custom-cut foam inserts in the case and lid have space for the entire DJI Ronin 2 and its accessories. There are individual slots for the gimbal with small size/mirrorless camera body attached, TB50 battery, remote control, upper ring with grip (on the lid), lower ring, motion block, top mountain block, camera baseplate, 15mm focus rod mount, quad charging hub, universal mount, top cross bar, accessory mount, 15mm rod, and battery charger, as well as cables and an accessories pack. Box Dimensions (LxWxH) 33.0 x 24.0 x 13.0"
Box Dimensions (LxWxH) 32.5 x 23.75 x 16.0"